It was my friend Jessica Topper who first told me about Erika Kelly’s books. She promised I’d love them – and so I could hardly wait to dig in and see for myself how right Jessica was. Which does not explain why, when I ran into Ms. Kelly’s books in the library a few months ago, I didn’t check them out. I’m kicking myself for that now, of course. Why deny yourself something so good? Take Me Home Tonight is the story of Mimi, the aspiring chef who works for Blue Fire, the band whose stories make up this series. Mimi chases a dream of working for her father and, by doing so, becoming the princess in his eyes that she’s always wanted to be. Of course, there’s a love interest, in the form of standoffish Calix Bourbon, the keyboard player with major commitment issues. That’s pretty much the story: how these two heal each other, grow, and come together. But of course, like the best fiction, there’s way more than that. The characters are smart, they are stupid, they are blinded by love and loyalty, they are brutally honest and walled up behind their fears, and they are both afraid to take chances. They are achingly human. It’s hard not to love Calix’s major entry into the story, when he pulls up on his motorcycle and saves Mimi from a fight with her father. Without uttering a single word, he establishes his bad boy persona, and it’s both hysterical and hot. This man doesn’t need words and it’s almost a letdown when he does begin to use them, especially because when aroused, he’s got a habit of speaking in caveman grunts. “Want you,” he’ll tell Mimi. I was into it until one of the other guys in Blue Fire speaks the same way to his girl. And then the magic went out. What a shame; it was such a neat nod to that man on the motorcycle. Another thing I really liked was the issues of family in here. I really liked that these characters had families; how often do our romances exist in a family-free vaccuum? Maybe not as often as memory is trying to serve, but here, the family issues fuel the plot, fuel the characters’ motivations, and help shape the entire story. Both Calix and Mimi are chasing their families, but for different reasons. Calix’s family is close. Mimi’s is the opposite, although not to the polar extreme, fortunately. If anything, Mimi’s family is more in keeping with the relationships a number of my friends and I had with our own families at that age: wanting the best for us but unable to trust that we needed to fumble through on our own in order to be able to fully appreciate the success that came out of those struggles. Even more than the band, I loved the family members, although I’m a little iffy on Jo. She seemed to come around too fast, to be too normal compared to what we are set up to expect. Coming into the series with this book, I was a bit let down that the members of Blue Fire come off as largely interchangeable. Granted, this is Mimi and Calix’s story, and they should take center stage, but I’d have liked to see more personality in the men, even if that meant they had to struggle a bit with the family for the reader’s attention; the series as a whole does, after all, revolve around them. It took me a good three quarters before I could recall which man had paired off with Violet and which with Emmie. This had a dual effect: to both irritate me beyond belief and to make me swear to go to the library already and catch up on what I’ve missed. I’ll definitely be reading this one again, for a couple of reasons. The e-ARC I got from NetGalley had formatting issues. I know I missed nuances that I’d have better appreciated without this issue. But also, as I said, I need to start with the first book, You Really Got Me, and immerse myself in the full Blue Fire experience. Take Me Home Tonight was a good place to start, a great introduction to this band, but dammit, it was so good, I want more. MORE. Just as my buddy Jessica Topper warned me: I’m now an Erika Kelly fangirl. I don’t like junkie stories. I don’t. So the fact that I liked Cherry Cox’s debut, It’s a Long Way to the Top, tells you how good it was. And I’m not saying that because Cherry and I have become friends and you’ll see more of her here at The Rock of Pages, either. We actually became friends after I realized this was a darn good book. Possibly even because of it. 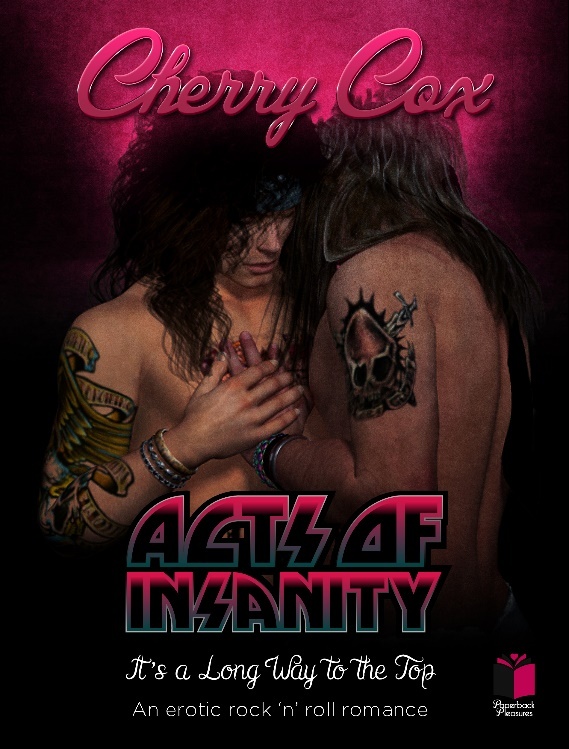 It’s the story of Jackson—Jax—who is in a band called Acts of Insanity. It’s the 80s, the band could maybe possibly break out if they record a killer demo and impress label people… and Jax is gay. But since this is the homophobic ‘80s, he can’t let people know. Including the band’s amazingly hot new singer, Harley. Now, what that synopsis doesn’t tell you is that Jax is also a heroin addict. A high-functioning addict, but an addict just the same. And while it made me sick when he shot Harley up after Harley got roughed up by some cops, it also made sense that he would choose that particular route of pain relief. After all, it dulls Jax’s pain… why not Harley’s, too? I think it’s the fact that Jax is high-functioning that sets this book apart from the other junkie lit books I’ve read (and hated). The other books tend to dwell on the struggle, on the descent into hell—there’s something pathetic going on in those other books. But in Cox’s world, Jax’s heroin doesn’t stop him from trying to move forward. On the one hand, he knows he has a problem. But on the other hand, he simply doesn’t care. He’s too busy. He’s got the band to take care of. He’s got relationships with people, including a friends-with-benefits woman. Yes, I said the gay man’s sleeping with a woman. In real life, things aren’t as easy as we often make them be in fiction, and Cox really hits on the complexities of life in this novel. Jax’s sister adores him, but doesn’t always act in what’s truly his best interests. Instead, she acts in what she wants Jax’s best interests to be. Which, of course, is what people do, and which, of course, results in disasters and hurt feelings. In the end, the band’s poised for success. It’d have been nice if Cox had ended it right there, on that cliffhanger, but she pushed it and took us into new territory. It feels forced and it took away from the high that Jax and company should have had at least a few minutes to enjoy. Because it’s Cox’s debut, we’ll forgive her this misstep. After all, she’s been nothing but honest with the reader and hasn’t shied away from showing the complications that erupt at every second. That’s what makes it real. But it’s also fiction, and there’s always a time to bend the truth to fit the reader’s expectations and the conventions of the genre. Still, I can’t wait to see what comes next for Jax and company. Just when they should be riding high, they’ve been hit with another complication (really, I wish that had started the second book), and it’s one that may or may not render the whole situation thus far moot. Or does it; I can also see this opening the band up to bigger and better. Oh, Cherry Cox. Write faster, will you? I started reading Don Bruns’ Mick Sever series in the middle, a number of years ago. I was an instant fan, so that meant I had to go back to the beginning. With Barbados Heat, I’m not quite at the beginning. This is the second in the series and even though it’s been a number of years since I read St. Barts Breakdown, I could still appreciate how much Bruns has grown as a writer since this early book. That’s not to say it’s a bad book. Not at all. In fact, it fills in many of the holes and questions I’d had because I’d started in the middle. It’s nice to see Sever’s ex-wife, Ginny, in action. It’s good to see a rougher version of the man Sever becomes. Sever is more of a music journalist than investigator in this book, but this might be where the transition begins. A former music biz insider turned Senator (who now crusades against the language in rap music) has been murdered, and it’s the senator’s son who’s been accused of the murder. Problem is, the son was one of Sever’s best friends. Not only does Sever have a plum story dropped in his lap, but his motivation for getting to the bottom of things has skyrocketed. His present is a stroll down memory lane, but not all’s what it seems. Of course Severs gets to the bottom of things; that’s what happens in a mystery novel. What’s fun is the way in which he does it, with things exploding, people chasing each other, threats that may not be real, and a sense of foreboding that turns out to be a red herring. The biggest problem with the book is that it often felt like there was more in author Bruns’ imagination than reached the page. This is hardly a fatal issue; it’s that the book would have been better, richer, rounder if all that information had been there on the page instead of someplace where I can glimpse it but not touch it. Oh, so tempting. I’m still a fan of this series, and there’s plenty more books for me to catch up with. Can’t wait.